We are pleased to introduce Ladders, a new platform that lets you benefit from how much the market moves rather than just which direction it is moving. Simply select your contract barrier and direction from our predefined price values. With Ladders, as long as the market moves in your favour, you may potentially receive a much higher reward-to-risk ratio compared to other binary options trading platforms. In the trade above at 8:00 GMT, you predict that EUR/USD will end higher at 12:15 GMT, with the current spot being 1.17233. You decide to buy a ‘Higher’ contract at the 1.17279 barrier at a price of $48.47 for a payout of $100 if your prediction is correct for a profit of $51.53. However, if you predict that the market will go down, you can buy a ‘Lower’ contract at the 1.16979 barrier at a much lower price. If you speculate the market will end below this value, you are increasing your potential return per trade. A new US Initial Jobless Claims report is being published at 12:30 GMT today. You predict that the report will have a negative impact on the value of the USD. 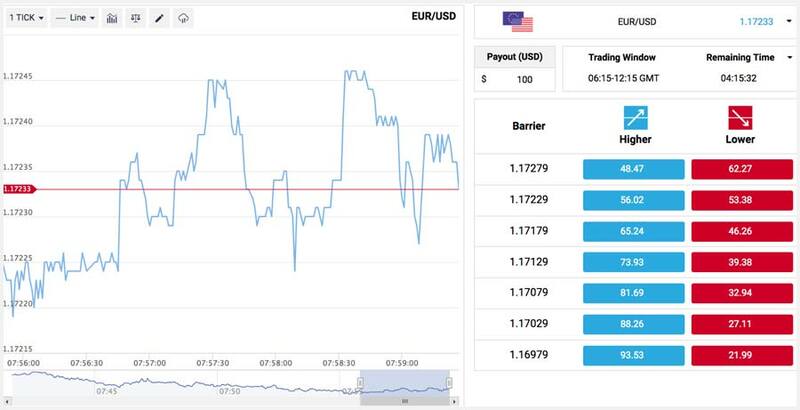 Within this scenario, you predict that the EUR will move higher than the USD by 14:15 GMT. 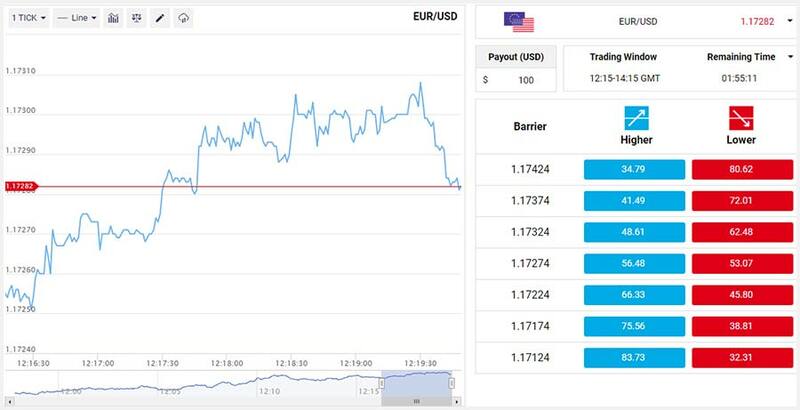 With the EUR/USD’s current spot at 1.17282, you decide to purchase a ‘Higher’ contract at the 1.17424 barrier that will give you a potential return of +187% –– a rate of return that is much higher than traditional Rise/Fall contracts if your direction prediction is correct. Choose a major Forex pair as your underlying asset and indicate your desired payout. Select your preferred trading period to populate the preset barriers, each corresponding to a higher or lower price. Choose your contract barrier and direction from the tiers of available values. Trade with Ladders now using your virtual or real money account.